Will the Best of Me be the Best? I have been trying to read all of Nicholas Sparks' books for the last couple of years in the hope of finding one where there was no tragedy and the hero lives. There are not many. One of my favorites is coming out in October and I must admit, I am a tiny bit worried it will end up like Nights in the Rodanthe. The book was wonderful, the movie - not so much. 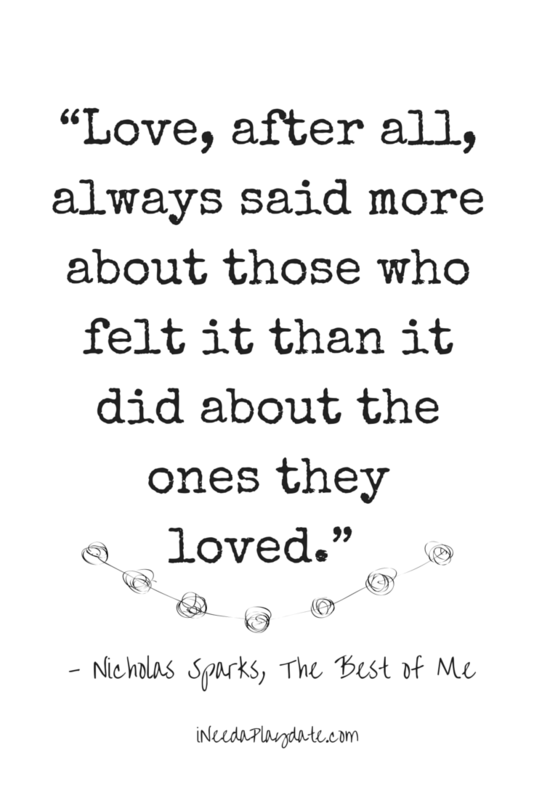 The Best of Me , is quintessential love, tragedy, love again, and more tragedy that is associated with Nicholas Sparks. His endings are rarely happily ever after but they are rooted in reality. Of course, the joy of reading (and going to the movies) is to escape our world so why do we purposely seek out tragedy? Is it because it makes feel alive without the personal heartbreak? Could it be that by connecting with the characters we know are destine to die or get their heart broken is to get a glimpse at what we may be missing or missed? My first love is not one I want to ever met again, under any circumstances. But, to live the love of others from the comfort of my sofa, well, that is something wonderful especially when the love of my life is near. I am so looking forward to seeing The Best of Me and crossing fingers and toes they don't happily ever after the end of it. What book to movie are you looking forward to seeing this year?